Over the last century, more people have been discovering the diverse applications of pure Lavender oil. Although it has been used for thousands of years in different cultures, a French perfume scientist by the name of René Gattefossé accidentally discovered it’s healing properties on the skin (his hand) when he suffered a burn in the laboratory. To this day, many people consider him to be the father of modern aromatherapy (and is credited for inventing the word). Though there are many different essential oils with different benefits, Lavender is perhaps the most versatile of all essential oils! Here is a great little starter list of 5, everyday topical uses (applying to the skin) for pure Lavender oil that we have found very useful around our home. Perhaps you will learn to use and enjoy it while reducing the use of processed products around your home. 1) Nerve irritations – Very recently (from eating something a bit too crunchy), I experienced an inflamed nerve in my face due to a minor scrape in the gums between my teeth in the upper jaw. I had done research and had used a lot of Lavender for other topical purposes before, so I thought I would give this a try. In order to use Lavender in this fashion, it has to be 100% pure, therapeutic-grade and be safe for ingesting. I rubbed some along the facial area, along the line where the pain was radiating. I also dabbed a couple of drops on my finger and massaged my gums at the location of the irritation. To make a long story short, the Lavender greatly reduced the inflammation and pain. 2) Healing cuts and scrapes – Last week, our little 4 year old daughter was excitedly running along the back sidewalk and suddenly tripped, scraping up her knee quite a bit. Though she was screaming and crying and did not want us to help, we immediately carried her to the table inside, sat her up, and lightly applied pure Lavender oil to the wounded area. Not only did it take away the sting in a few minutes, it sanitized the scratched wound safely. The next day, it was already healing visibly and more rapidly than if we would have applied some over-the-counter antiseptic with a bandage. We love using Lavender oil for minor cuts and scrapes for its soothing properties and its ability to cleanse and promote natural healing. If you have never tried lavender oil before, you might want to try this essential oil recipe for cuts and scrapes that has a carrier oil so that it is more mild. 3) Bug Bites – Ouch! – I am not sure if we have really sweet girls (we know we do) or it is just a crazy summer for bug bites, but our little girls sometimes get bitten by mosquitoes. Recently, we began using Lavender oil to not only repel many bugs, but to soothe the bites that get through the lines of defense and leave itchy, inflamed welts. We have found that swollen welts on little girls with sensitive skin respond very well to Lavender oil. It can soothe the itchiness and help promote healing, while also providing an antiseptic benefit that is safe. 4) Acne and small blemishes – Not only can teens use Lavender oil to help safely treat acne flare-ups, but us adults can too. Although we thought that acne was a thing of the teenage years, we adults get flare-ups every now and then and Lavender can be very effective. It should be tested on a small, inconspicuous spot before applying to a broader area of the face, to be sure you do not have a reaction. In any situation, it should be used conservatively on facial areas. 100% Pure Lavender oil not only kills harmful acne bacteria, it helps curb the sebum production in the skin (that oil that the bacteria feed on producing acne flare ups). 5) Soothing muscles and over-active nerves – It has been noted that Lavender oil can help soothe muscle tensions while helping to calm over-active nerves. Whether Lavender oil is used in a soothing bath, or is massaged on the skin where the muscles ache, it promotes soothing, relaxation and healing to those sore or over-active areas. 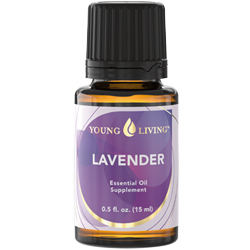 If you are new to Lavender or essential oils, we recommend you start with 100% pure, therapeutic-grade Lavender oil from Young Living because it is digestible and is of the highest quality that one can find on the market. A little Lavender oil not only has a seemingly endless list of uses, but it really does go a long way. It is even useful for feelings of well being and happy aromatherapy. These statement has not been evaluated by the Food and Drug Administration. This information and product are not intended to diagnose, treat, cure, or prevent any disease.This article was not written by medical professionals and the suggestions for topical lavender use should NOT replace the advice of a medical professional. You may also like to read about 9 Everyday Essential Oils.